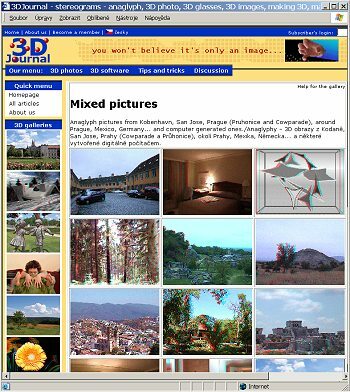 3D photos and 3D movies allow you to see rich 3D world - not a flat one as with standard 2D photos and 2D videos. Some parts of 3D pictures are more closely, other are farther. Some even can "go out of the screen". And what is most important - to take a 3D photo or to record a 3D movie is very easy. 3D photos, 3D video, 3D games etc. can be watched in a few ways. And what is probably the most often used one? The cyan/red glasses. You can buy them together with membership of 3DJournal club. You can buy our software for creating 3D images (movies and animations) as well (we offer the trial version for non members as well). You can use any camera for taking 3D photos. What is the procedure? Very simple. You can read it in this article which is freely available on our website. You can use a few tricks to make better 3D photos - you can read more in this article about Tips and Tricks for making the best 3D photos and one more important hint you will find in this article . A little bit more complicated is recording of 3D movies. At the beginning you can try to convert your 2D movies to 3D - as described in this article . If you want to get better results then start recording in 3D. You will need 2 movie cameras or a movie camera and a still camera. How to do it? Just read this article about how to record 3D movie . Maybe you are more interested in playing of 3D games, in painting of 3D pictures or 3D collages or in converting of 2D photos to 3D photos. You can read about these topics for example here - 3D game - duel in space , How to paint 3D images , 3D collages and Conversion of 2D photos to 3D . 3DJournal writes about how to create artificial 3D images on your computer - rendering of 3D images and how 3D images work as well. We've tried to draw your attention to the most important 3D Journal articles here - but you can find much more on our pages. We wish you a nice time with 3DJournal!